Posted on 12, August 2016 by EuropaWire PR Editors | This entry was posted in Construction, Education, United Kingdom and tagged engineering, GRAHAM Construction, LLWR), Low Level Waste Repository Ltd, UTC students. Bookmark the permalink. Partnership joins forces with students. Workington, UK, 12-Aug-2016 — /EuropaWire/ — Partners GRAHAM Construction and Low Level Waste Repository Ltd (LLWR) joined forces with students from the Energy Coast University Technical College (UTC) to show that engineering could be fun – and they got EGGS-actly what they were looking for. After a tour of the LLWR site near Drigg, students returned to UTC at Lillyhall to work on a special exercise to devise robust packaging for eggs. They were each allocated specific roles in the construction process, such as project manager, structural engineer, technical co-ordinator, procurement manager and design engineer. The eggs in their secure packages were then dropped from a great height, stamped on and hit with bricks to test if they would crack. 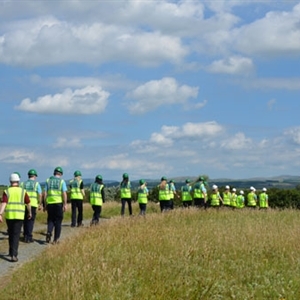 The exercise mirrored LLWR’s current Type B Packaging Programme, which will produce packaging to transport legacy materials by rail to Sellafield from the LLWR site and Magnox Harwell, in Oxfordshire. Cath Giel, head of public affairs at LLWR, said: “We first worked with UTC last year and it’s important to show tomorrow’s workforce what engineering can offer. GRAHAM Construction is LLWR’s Framework partner and Elaine Woodburn, its stakeholder engagement officer, explained that the day was organised to showcase the many varied careers within engineering. Elaine added: “Judging by how the students got stuck into the task it was evidently something they enjoyed.